After you set up Google Analytics using the OMAP 2.0 method, the following error occurs in the analytics reports: An internal error occurred. Select the site's corresponding app pool. Select advanced settings on the righthand side. 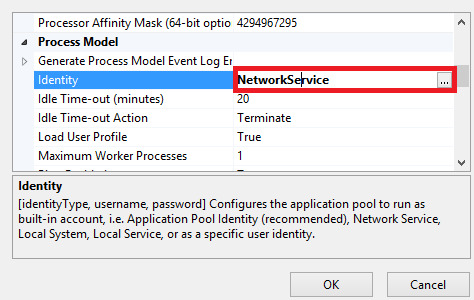 If Identity is not NetworkService, change the identity to NetworkService. Your site root must have full control for NetworkService to operate properly.